EduBridie claims to be able to complete any kind of paper, but its freelance writers are not capable to cope with every writing challenge. The price setting is unclear; you’re not aware how much you’re going to pay when you place the order. Speaking of the order, the form is too complicated and requires too much information. Another negative point is that the service doesn’t provide discounts. As for the customer support center, it was simply impossible for us to get in touch with them and get the answers we needed. As a website, EduBirdie looks well. You see a claim: “Get your essay written starting at just $18.00 a page.” It seems like a nice offer, right? Well, our impressions were ruined the moment we started exploring the website a bit further. This is a bidding service. You place an order, and then the writers who have time to complete your project start bidding on it. We’re saying time, not time and skills, because, as it turned out, most of the bidders didn’t have the needed skills. EduBirdie.com claims to be able to complete any kind of paper. In the list of services, which is available when you’re ready to place an order, you’ll see admission essay, essay of any type, research paper, capstone project, business plan, and even research proposal, thesis, and dissertation. The list of services is really extensive. There’s a problem, though: these freelance writers are not qualified for these projects. You’ll see a writer named Archaeologist+, and he’s written projects from criminology, English, psychology, nursing, and history. There’s not a clear pricing system here. 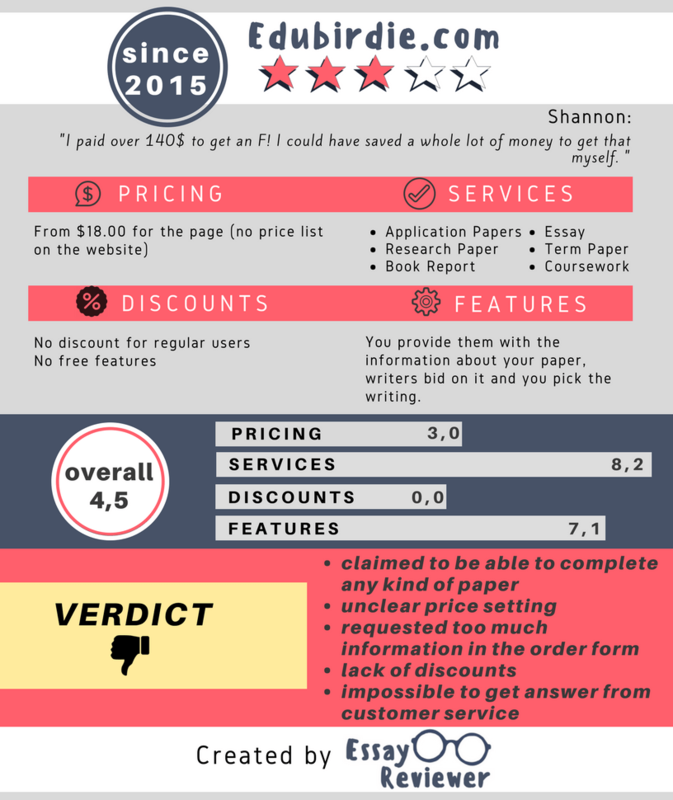 The only indicator is the one about quotes starting from $18.00 per page. When you realize that these are not experienced writers with degrees in the areas of study they cover, this is not an affordable price at all. Forget about EduBirdie.com cheap prices; most writers bid above that minimum. We chose to work with a writer who seemed qualified enough, and he gave us a price of $27 per page for a deadline of 9 days. There’s no EduBirdie.com coupon to count on. You’ll get different price suggestions, so you pick the one that works for you. No. This content was completely paraphrased from online resources that are easy to find. Clearly, this is not the place where you get 100% unique content based on research, references, and original arguments. At first sight, the paper seemed fine. However, it was not something that would get a student a good grade. The ordering process itself was nerve wracking. The order form requests too much information. You have to log in or sign up before you can even access it. Then, you start getting emails every day, even if you don’t want to proceed with the order. Since this service is based on the communication between the customer and the writer, they didn’t pay much attention to the customer support system. There’s a 24/7 live chat, but it doesn’t work. It’s impossible to get answers from the representatives. Our writer was not attentive to our requests, either. He didn’t bother providing updates and he ignored many of our messages. To wrap up our EduBirdie.com review, we have to say this is not a service we would hire again. The website looks nice at first, but the ordering process wasn’t convenient and the result was not satisfactory. I was looking to find a company capable of writing the ideal essay for me but after using the services of this one I realized that I should keep looking. My essay was written really poorly and the writer failed to incorporate most of my requests. This is unacceptable. I gave them the second chance by requesting a revision but that a bad idea as the quality of the essay didn’t improve a lot. So don’t waste your time with this service and try to order from someone else.